Vanakkam, my name is Becky Smith and I was lucky enough to come along to the Swindon Tamil Association's Deepavali celebrations on 1st November. I gave a short presentation about my visit to the Kattaikkuttu Gurukulam in Tamil Nadu, India. 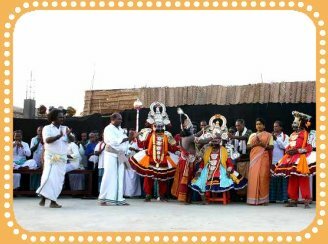 Kattaikkuttu is a music-theatre style specific to Tamil Nadu that uses dance, singing, acting and the wearing of wooden ornaments to tell stories from the Mahabharata. The school is funded externally and aims to teach the 44 students to be professional Kattaikkuttu actors and musicians. As well as this, the students complete the Government exams with the support of the school and its volunteers. This gives the students a better opportunity in life as they come from deprived communities.